This is the first in a two-part series on siblings in family businesses. Part one will cover some successful sibling partnerships, while part two will discuss lessons for siblings who are in business together. Running a family business is never easy, and can be particularly hard when siblings run it together. Ever since the days of Cain and Abel, siblings have fought and competed and vied for their parents’ attention. To make it worse, they often didn’t choose to be partners, but were forced into the situation by a parent. But these partnerships can and do work. Siblings can run a successful business together. Here’s a look at three famous sibling partnerships. 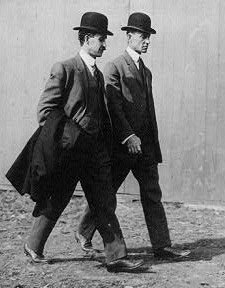 The Wright Brothers, whose successful partnership led to the first functional flying machine. Although they weren’t the first to build a flying machine, Orville and Wilbur Wright invented aircraft controls that let a pilot steer an aircraft. They took lessons from their work repairing bicycles to figure out how to control an airplane. Their first business was a printing shop, with Orville serving as publisher while Wilbur was the editor, when Wilbur was 22 and Orville was just 18. That business was short-lived, followed by the bicycle repair shop. Their interest in flying eventually led to the first successful airplane flights in Kitty Hawk, North Caroline in 1903. Brothers Maurice and Richard McDonald planned to make their millions in the movie business after a move to southern California from their native New Hampshire. When that didn’t work out, they sold barbeque and hot dogs. In 1948, they revamped McDonald’s Famous BBQ by downsizing the menu, getting rid of car hops and streamlining production in the kitchen. They wanted a symbol for their restaurants, creating the famous Golden Arches, much to the distress of their architect. They also began franchising their concept, which caught the eye of Ray Kroc, a milkshake machine salesman. Ray bought the national franchise rights in 1955, purchasing the company outright in 1961 for $2.7 million. Now the fast food giant takes in more than $27 billion a year. The brother’s partnership worked well and Richard expressed no regret at selling the company. “I would have wound up in some skyscraper somewhere with about four ulcers and eight tax attorneys trying to figure out how to pay all my income tax,” he said. We all know who Walt Disney is. Less famous is his older brother Roy, who was his co-founder of Walt Disney Productions. Walt was the visionary; Roy was the finance guy, generally a less flashy role. “Walt had this idea [for Walt Disney World]. My job all along was to help Walt do the things he wanted to do. He did the dreaming. I did the building,” he once told reporters. They started working together at a young age, delivering newspapers after their dad bought a route. Roy was a banker in Los Angeles when Walt moved there and they founded Disney Brothers Studio in 1923 to produce short live action, animated films. In 2014, the company reported revenue of more than $48 billion. Despite any lingering childhood issues, siblings can form successful partnerships. Come back next week for tips on how to run a business with your brother or sister.